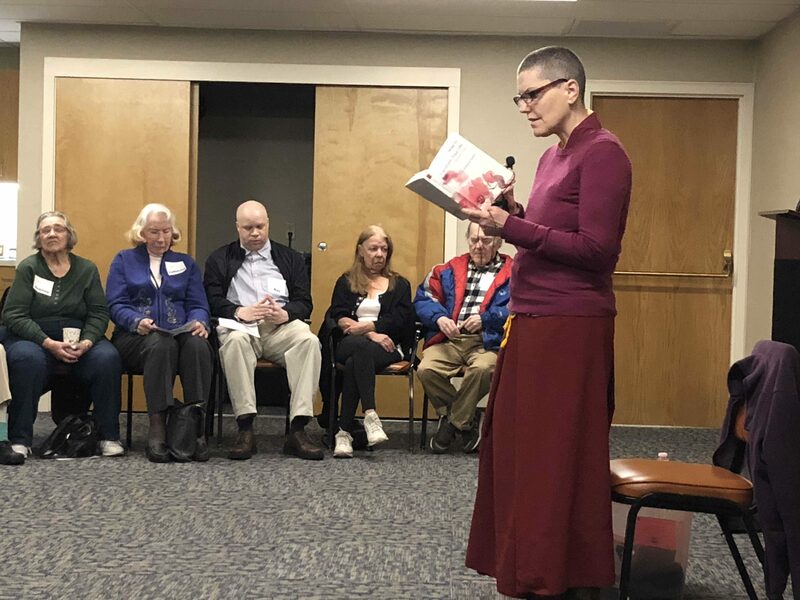 “Inner peace is the source of happiness.” That was the message Gen Kelsang Chokyi from the Atisha Kadampa Buddhist Center brought to a group of INSIGHT clients on April 4 as part of a meditation workshop held at the agency. Through a series of guided meditations, stories, and experiences from the group, Chokyi helped the participants think about the ways that they could build a happier life despite the adversities they may face each day. “Each one of us struggles,” she said, “the key to dealing with those challenges however is to try and put them in perspective and not let them become outsized in our minds.” Comparing our minds to the sea, she said that our minds are designed to be like calm waters but when stress, anxiety, anger and other emotions seep in it is like winds churning the sea into a storm of large waves that can easily overwhelm us. One participant, Donna, said that she had come into the workshop with an ache in her hand but by the end of the meditation she did not feel any pain at all. Chokyi explained that it was not that the pain went away, just that her mind changed its focus. “The body follows the mind,” she said. Overall the participants enjoyed the workshop with most saying that they would try to incorporate meditation into their daily routines.